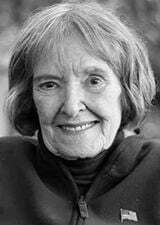 RACINE—Patricia Ann Gordon Hart, born in Baltimore, MD on July 1, 1932, rejoined her beloved husband, John William Hart, upon her death in Racine, Wisconsin on February 9th, 2019 at Ridgewood Care Center. Pat grew up in Baltimore with her parents and as the youngest of 6 siblings. She was involved in many activities growing up, even earning some recognition for her bowling skills. She appreciated music, dances and a good party. As a young adult, her charm at these social occasions led to 4 marriage proposals she declined, and a 5th she accepted. After they wed, Pat and John went on to have 5 children while living in Baltimore. John’s career led to a move to Racine, Wisconsin, where they doubled their number of children in fairly short order. Pat managed her large family’s health and well-being while ensuring school uniforms were hemmed and hair pristine for the Sunday takeover of an entire pew at Holy Name Church. She was also known to break out in song and tap dance while her children sat mesmerized along 2 benches flanking the long kitchen table. It is suspected Pat Hart holds the world record for number of read alouds of Hop on Pop and Green Eggs and Ham. When those tales wouldn’t do, she’d tell her children stories from her own childhood and family. Late in her life, dementia muddled up some of those memories, so she conjured up new ones. Spectacular ones. Ones her grandchildren will retell for years. When Pat was just 46, with 10 children ranging in age from 7 to 21, her partner and husband died. Widowhood would not slow Pat down. While continuing the parenting solo, she also surrounded herself with good friends, a few hobbies and work outside her home. She faced everything head on with courage, determination and and strong sense of self. Something her children and grandchildren carry with them every day. Pat didn’t travel an easy road. Throughout her life and even as she began the process of dying, her courage rose to each new demand. She has been an example of resilience and determination for many. Her legacy of love, courage and strength lives through her children, grandchildren and great grandchildren, as well as the many others she’s touched in her 86 years. 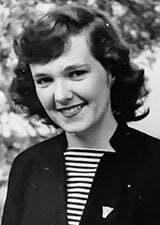 Patricia is preceded in death by her parents Margaret B. Gordon and William J. Gordon, her loving husband, John W. Hart, her siblings William Gordon, Joseph Gordon, Dorothy Rhodes, Donald Gordon and Bernard Gordon, as well as a lifetime’s worth of dear friends. She is survived by her children Michael Hart, Janice Werner (Charlie), Karen A Hart, Trish Hart, Sharon Hart-Russo (Bill), Susan Hart, Kathy Hart-Braun (Tony), Terri Hart-Ellis (Michael), James Hart (Kunduz), John Hart (Jen), 16 grandchildren, 2 great grandchildren, friends and neighbors. She is also survived by beloved friend and caregiver, Tommy Porcaro, who nourished her sense of humor and fun, who ensured her daily comfort and joyful moments in the last years of her life. Pat’s family is forever grateful. Please join the family in celebrating her life on Friday, February 15th, 11:00 am at the funeral home. Interment will follow at Calvary Cemetery. Relatives and friends may meet with the family Friday at the funeral home from 10:00 am until time of service at 11:00 am. Thank you to the staff, volunteers, residents and visitors at Ridgewood for the warmth and care shown towards Pat during her final year. Thank you to Seasons Hospice & Palliative Care for facilitating her last months with dignity, comfort and grace.